In 1990, a battle was being waged on an obscure information eddy—unknown to most of the world—called the internet. Librarians and established editors around the world went about their day to day business, unaware of the coming tide, while Marxists battled fascists and post modernists across the spectrum of newsgroups, in a battle for information. Fascists were denying the holocaust, professors were pronouncing Marx dead, while bystanders were repeating the mantra of "Communism works in theory, but not in practice". The Soviet Union was crashing down, while the leftists of the world were in a daze—disillusioned and doubtful. The few who hung on couldn't help but to repeat the used-up 'marxist answers' of the past, not recognizing the new world to come. Marxism needed a cocoon, an archive—to measure its validity in totality, and to give it rebirth amid the shattering of the Soviet style “Marxism-Leninism”. The puzzle was vast, challenging, almost unbreakable. So much information to reconcile—so many contradictions to explain. What did Marx really say? Did Lenin support Stalinism by talking about the need for a dictatorship of workers? Is Marxism pro-freedom and pro-democracy? Who was Trotsky, and what significance does he have to Marxism? Was the Soviet Union entirely corrupt, backwards, and a failure or did it do some things constructively and healthy? In 1990, battling the onslaught of misinformation, a worker named Zodiac started the task of archiving Marxism, piece by piece. We didn't have answers; we had information. Instead of arguing one opinion against another, we saw that the way to resolve this mis-information was to type up the works of Marx and Engels and distribute them as widely as possible. We believed that the overwhelming dominance of secondary and tertiary information obscured and distorted Marx and Engels—transparent even in the works and positions of so-called marxists, who, lacking in thorough and broad understanding of the works themselves, had been reduced to dogma. Marxists around the world were renown in political circles of every kind for having the largest and most thorough libraries: but theses libraries only benefited one individual, those immediately around her, and only helped her work in the world. In these steadfast traditions, we began creating and pushing towards a course of continual expansion the first world-wide library of Marxism. We weren't doing this just to understand the world, but also to create a new level of consciousness in people the world over, to show the value of Marxism in spite of and because of the failures of its practiced progeny; to show the value of critique in this era of conformity; and to show the value of being a revolutionary in this era of reaction. In this way, the texts of Marx and Engels were posted to various newsgroups on usenet (misc.activism.progressive, sci.econ, soc.politics.marxism, alt.society.revolution, soc.history, and more). Meanwhile, every effort was made to encourage the wide distribution of this information to "BBS eddies around the globe"—and find their way these works did! As early as 1993, BBS's in nations like Singapore were illegally distributing these texts despite draconian censorship laws. Unfortunately, however, this method of distributing texts was highly problematic: newsgroup retention policies often only lasted a limited number of days, and newsgroup archives were non-existent or difficult to access. The end result was that it was difficult or impossible for people to find or reliable access to these works. Nov 26, 1993: Well, I'm happy to say, those days of chaotic distribution are over. At long last, after wandering the cyber-deserts in exodus, all these Marx/Engels etexts now have one, cozy, communal home. In the summer of 1993, Martha Gimenez recognized the importance and potential of the work Zodiac was doing. She understood that the way to make a lasting impact and bring this work to a new level was through the utilization of an entirely new technology—the world wide web. Utilizing the resources of Colorado University, under the guise of the Progressive Sociology Network, Marxism found a place on the www. As a result of this exposure to the web, leftists from across the spectrum and around the world began to participate in the project—from Anarchists to Maoists, from Stalinists to Trotskyists. The first authors posted outside Marx and Engels were De Leon, Lenin, and Trotsky. This presented great opportunities to represent the real diversity of Marxism, but it gave way to very different opinions as to how Marxism should be portrayed on the internet. The archive began to spread it's roots on the newly born world wide web, with volunteers putting up mirror sites in universities and progressive organisations in the United States, Canada, South Africa, Australia, and the United Kingdom. Beginning around 1995, however, a series of censorship struggles within almost every university closed down the mirrors, with even CSF taking our archive down for a period. Navigate part of MEA in September of 1996. These problems prompted the group to create marx.org, and host it on a commercial ISP on October 26 1996, changing the name to the Marx/Engels Internet Archive (MEIA). The library began to expand as the world wide web was becoming more widely used, and thus more volunteers were becoming involved in the project. In 1996, David Walters became the first director of the Leon Trotsky Internet Archive while Mike Lapore took the helm in directing the Daniel De Leon Internet Archive; many others contributed as much as they could—see the what's new page of the MEIA (Jan 1997 to May 1998) for a record of this activity. By 1997, MEIA began facing it's first internal problems. Professional commitments left Zodiac with little time for the many and increasing duties necessary to administrate marx.org, resulting in the appointment of a "Communications Director", Sally Ryan. Sally lead the way in assisting volunteers with transcriptions, adding new works, updating the site, answering mails, etc., while Zodiac held onto overall control. Zodiac justified this top-down approach on the basis of journalistic and academic publications who have a top editor to make the final decisions. Any other means, Zodiac believed, never worked in the end—democracy is possible only on a small scale; as things get larger splits are imperative. Furthermore, Zodiac explained in retropsect that Marx and Engels were the main thrust of the project, that the project was solely academic and not political, and that dealing with the rest of Marxism was a "slippery slope" of sectarianism and division. Thus, while the expansion of the project was momentarily tolerated, it became continually more difficult for Zodiac to deal with. By the spring of 1998, after internal dispute with volunteers about how the archive should be organised, both in terms of Marxist content and organisational structure, Zodiac informed Sally and David that all writers but Marx and Engels would be removed from marx.org, thus cutting off many volunteers from continuing their work. In March 1999, even Marx and Engels were removed, leaving an empty marx.org marooned to vacancy. In 2002, Zodiac gave up control of the neglected domain name, and MIA grabbed it up. With the internal dissent in the spring of 1998, a large group of volunteers were strongly dissatisfied with the lack of democracy in the organisation, and unhappy about the organisational structure and focus of the archive. A volunteer for the Trotsky Internet Archive, David Walters, started a discussion among some of the archives' volunteers and people associated with another online project: the Encyclopedia of Trotskyism. At first, some in the group (from ETOL) suggested the name Marx/Engels, Lenin, Trotsky Internet Archive (MELT). After a good deal of discussion however, it was decided to drop this name and instead call the revived organization the Marxists Internet Archive; intending a more encompassing purpose with an organizational structure that was committed to being completely open and democratic. 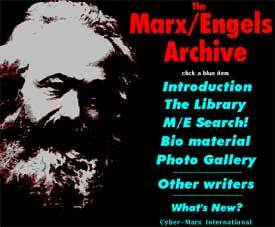 The Marxists Internet Archive (marxists.org) was created in July 1998, built through the efforts of Jørn Andersen, Brian Baggins, Chris Croome; Alphonsos Pangas, and David Walters. After a great deal of transition work, one of the first things MIA did in advance of our old organisation was create a History Archive (holding Soviet History), and later separated Marxists from Reference Writers, by placing Stalinists in the Reference archive.